By clv4@duke.edu in Learning Innovation, Library, OIT Training on January 26, 2012 . Presenters - Samantha Earp, Paolo Mangiafico & Shawn Miller discussing the collaborative tools available at Duke. 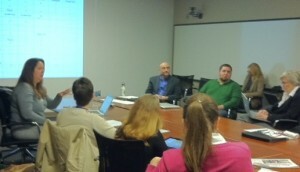 Missed yesterday’s Learn IT @ Lunch Session “Sakai and WordPress and SharePoint, oh my!”? Watch it online. Note: You may be prompted to update your MS Silverlight Plug-in.